"The climatological definition of frost is the occurrence of an air temperature of less than 2.2°C, and a severe frost occurs when the air temperature decreases below 0°C. This definition is used because air temperature is measured at a height of about 1.3 metres above the ground. Overnight the ground temperature may be several degrees lower than the air temperature at thermometer height." 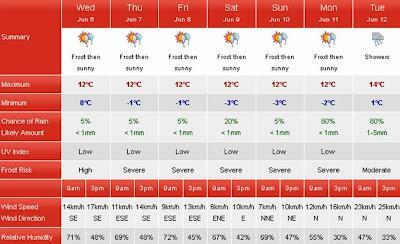 By the look of this week's forecast (above) June is set to be even frostier...brrrrr!